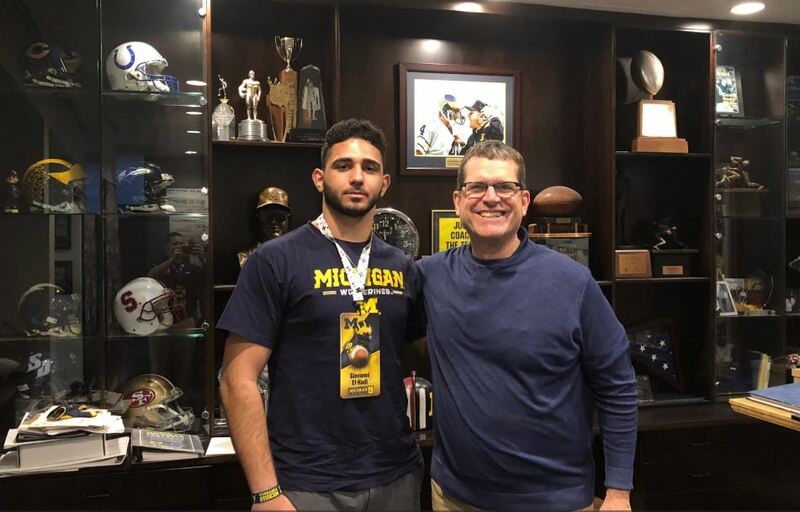 As the Michigan coaching staff focuses on spring ball and the 2020 recruiting class, it just got some big news from the future as rising in-state Adlai Stevenson (MI) OT Giovanni El-Hadi has become the first commitment of the 2021 class. El-Hadi sports an elite frame for an offensive tackle as just a sophomore in high school. He’s raw in his technique, as you’d expect, playing a little high at times but his natural athleticism are very intriguing. He plays with an edge, burying opponents given the chance. His ceiling is extremely high, it’s easy to see what the coaches saw in his sophomore tape. He’s a guy I see shooting up the rankings as he gets to more camps and gets into his junior season. As a local, younger recruit, this was a recruitment that looked like it could be a quick one if the staff extended an offer. Thanks to a big sophomore season and standout performances at winter camps, Power Five programs took notice. But it was the offer from Michigan during an unofficial visit to campus that took precedent. It took just two days after receiving that offer to decide to commit to the Wolverines and become the first addition to the 2021 class. El-Hadi is the first overall commitment of the class, which should have an in-state flavor. Michigan is full of top flight prospects including five-star teammates OT Garrett Dellinger (#2 overall) and DT Rocco Spindler (#10 overall). The state also has top 100 prospects five-star OG Damon Payne (#26 overall), four-star RB Donovan Edwards (#68 overall) and OC Raheem Anderson. Other names out of state to watch include five-star DE JC Latham (#8 overall), five-star DT Dominic Bass (#24 overall), five-star OT Hayden Conner (#27 overall), five-star OT Landon Tengwall (#39 overall), four-star OT Blake Fisher (#87 overall), four-star ATH Ethan Calvert, LB Aaron Willis, and OLB Yanni Karlaftis.